What Was So Special About Chicago’s Beautiful West Night Sky? 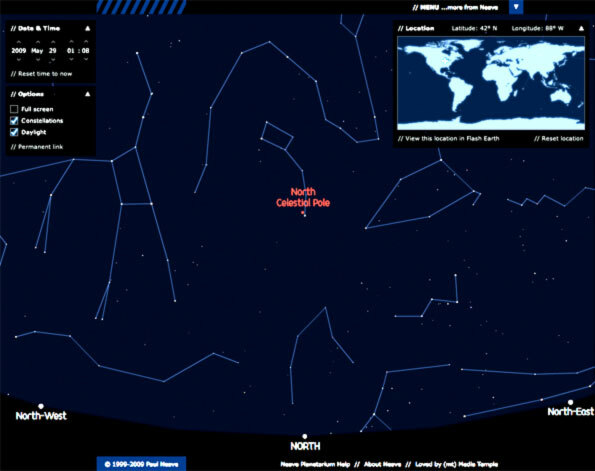 Do you want a quick and easy way to see what’s up in the night sky in Chicago? 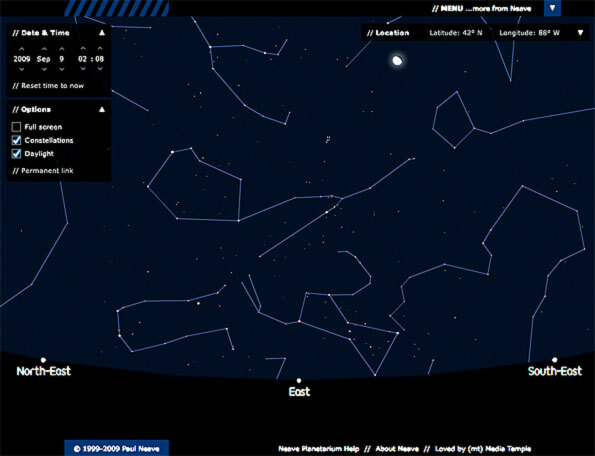 Then click on the star field below that already shows a view looking North. A new window will open. Look for the “Reset time to now” command, upper left. If you want the night sky anywhere in the world, reset the location, upper right. A view of the night sky looking north May 29, 2009 at 1:08 a.m. Click the image to see the dynamic view for May 29, 2009, then use the controls to see the current view, or choose another date and time. A view of the night sky looking east August 29, 2009 at 1:08 a.m. Click the image to see the dynamic view of the night sky for August 29, 2009, then use the controls to see the current view, or choose another date and time. A view of the night sky looking east September 9, 2009 at 1:08 a.m. Because stars appear to advance from east to west, just like the sun, the sky at 1:08 a.m. on September 9, 2009, except for the moon, is about the same sky at 2:08 a.m. on August 29, 2009. In other words, the stars appear to advance ahead an hour as the year passes by … and the advance seen in one hour on a single night is about the same advance seen 11 days later at the exact same time. 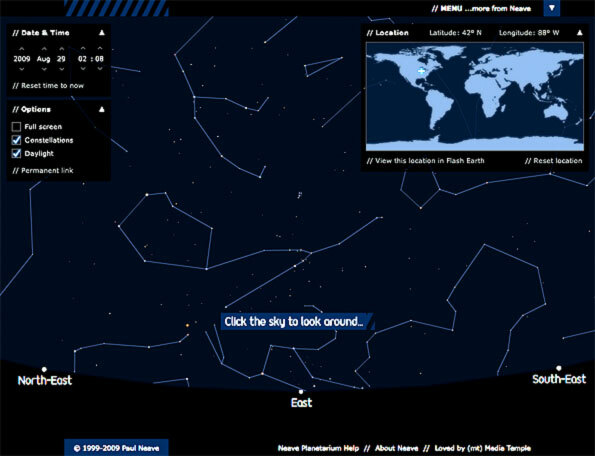 Click the image to see the dynamic view of the night sky for September 9, 2009, then use the controls to see the current view, or choose another date and time. Neave PLANETARIUM … or use the following link for an example head start … A specific preset view of the Neave Planetarium night sky looking north May 29, 2009 at 1:08 a.m. Click the link to see the dynamic view for May 29, 2009, then use the controls to see the current view, or choose another date and time. Here is the weather section for enjoying the night sky. Using the ‘Night Sky’ section, it’s easy to find constellations, planets and bright stars and learn when they rise and when they set. A planetarium shows the sky, complete with stars, constellations, the Moon and the Sun, for the current date, or you can set the date and time for a future or past dates and times.